These barbecued chicken drummies are still favorites, but lately we've been making The Kid pick them up and eat them himself, rather than cutting the meat off for him. Last night as we were having them for dinner, he objected, saying they were too sticky. (This was after he ate his mashed potatoes with his fingers.) I remembered this fantastic tip from Lunch in a Box by way of Lunch Bucket Bento, and he ate them without any complaint. 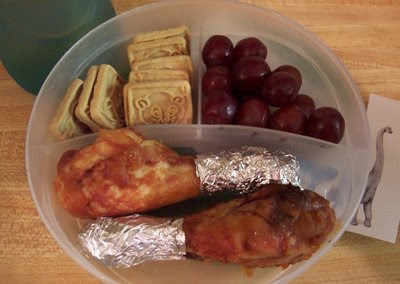 It worked so well, that for Preschool today I packed up the leftovers with red grapes and animal graham crackers with the usual bottle of half apple juice and half water plus a dinosaur sticker (a Brachiosaurus for those of you keeping track) to make an extremely simple lunch. Pre-schoolers and I got somethin' in common - I totally understand about the sticky!